First Line: She awoke suddenly out of a troubled sleep. When horse trainer Annie Carson responds to a roadside rollover, she learns that the driver didn't survive-- and she wonders how in the world the beautiful Thoroughbred she's taking back to her stable did. The slightly injured but very upset horse is owned by local Hilda Colbert, and after allowing the horse some time to recuperate, Annie takes him to Hilda's state- of-the-art ranch. What should have been a simple handover turns into something much more serious when Annie finds Hilda's dead body. Two deaths in three days are unheard of in Annie's county on the Olympic Peninsula of Washington, and when she meets Hilda's husband (AKA Suspect #1) she decides the police definitely need her help in finding the real killer. But is she really equipped to take on someone who's determined to go free even at the cost of innocent lives? Reining in Murder raised some decidedly mixed emotions in me as I read. 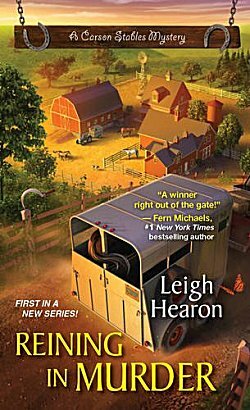 Leigh Hearon has created a good, solid mystery, and all the scenes concerning horses and dogs are excellent. The author also created a very intriguing pairing of characters with the elderly Martha and Annie's irritating sister Lavender. These are all good bits that I really appreciated. However, I think your enjoyment of the book is going to hinge on your perception of the main character, Annie Carson. Mine certainly did. Annie is 43 years old, but her emotional behavior makes her appear much, much younger. She gets on her high horse a lot over others' behavior towards her or their tones of voice. She also does something that drives me nuts: she sits on evidence. She finds vital clues and then does nothing with them. Eventually she has a guilty moment and calls the sheriff to tell him what she's found, but if the sheriff doesn't use the right tone of voice, or if he's not sweet as sugar to her, she gets huffy and the phone call turns into a hangup. One of the main reasons why Annie gets involved in the investigation is because she gets a good look at the handsome husband of the dead woman, becomes starry-eyed, and decides he's being unjustly accused. More teenage behavior, and I found this all a bit difficult to accept from a woman in her forties. Fortunately Annie begins to snap out of it in the last third of the book, and that saved this entire review. Hearon has written a good mystery that animal lovers should enjoy a great deal. Hopefully Annie Carson will have an even higher emotional IQ in the next book in the series. That's just it, Cathy. At times, perception of the main character either 'makes' or 'breaks' a book/series. I'm not sure how I'd feel about Annie, especially not dealing realistically with evidence. Still, the setting sounds lovely, and I do love horses. I'm glad you found some things to like in this one. Yes, the setting and the scenes with animals are really good, Margot.